Another art fair week is descending onto New York, bringing in collectors, artists, and galleries from every corner of the globe. 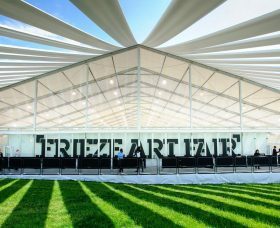 This year’s Frieze week is a little more chill than last year’s—the fair itself has shortened by a day, and several of the satellite fairs have declined to make a reappearance. However, despite a scaled down event, there are plenty of additional options to fill your social calendar, including sister fairs CONTEXT and Art New York, and a show entirely made up of immersive installations curated by SPRING/BREAK in Brooklyn. For those who are more into design and architecture, the Collective Design Fair opens with the very best from the fusion of the art and design worlds, while Times Square gives us a glimpse into the terrifying vision that Robert Moses had for Lower Manhattan through a new animation.